The Jamie L. Whitten Building in Washington D.C. The current head, the Secretary of Agriculture, is Tom Vilsack. Early in its history, the economy of the United States was largely agrarian. Officials in the federal government had long sought new and improved varieties of seeds, plants and animals for importation to the United States. In 1837 Henry Leavitt Ellsworth, a Yale-educated attorney interested in improving agriculture, became Commissioner of Patents, a position within the Department of State. He soon began collecting and distributing new varieties of seeds and plants through members of the Congress and agricultural societies. In 1839, Congress established the Agricultural Division within the Patent Office and allotted $1,000 for "the collection of agricultural statistics and other agricultural purposes." Ellsworth's interest in aiding agriculture was evident in his annual reports that called for a public depository to preserve and distribute the various new seeds and plants, a clerk to collect agricultural statistics, the preparation of statewide reports about crops in different regions, and the application of chemistry to agriculture. Ellsworth's agricultural focus earned him the sobriquet of "The Father of the Department of Agriculture." On May 15, 1862, Abraham Lincoln established the independent Department of Agriculture to be headed by a Commissioner without Cabinet status. Lincoln called it the "people's department." In the 1880s, varied advocacy groups were lobbying for Cabinet representation. Business interests sought a Department of Commerce and Industry, and farmers tried to raise the Department of Agriculture to Cabinet rank. 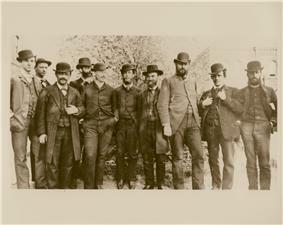 In 1887, the House of Representatives and Senate passed bills giving Cabinet status to the Department of Agriculture and Labor, but the bill was defeated in conference committee after farm interests objected to the addition of labor. Finally, on February 9, 1889, President Grover Cleveland signed a bill into law elevating the Department of Agriculture to Cabinet level. In 1887, the Hatch Act provided for the federal funding of agricultural experiment stations in each state. The Smith-Lever Act of 1914 then funded cooperative extension services in each state to teach agriculture, home economics and related subjects to the public. With these and similar provisions, the USDA reached out to every county of every state. During the Great Depression, farming remained a common way of life for millions of Americans. The Department of Agriculture was crucial to providing concerned persons with the assistance that they needed to make it through this difficult period, helping to ensure that food continued to be produced and distributed to those who needed it, assisting with loans for small landowners, and contributing to the education of the rural youth. Today, many of the programs concerned with the distribution of food and nutrition to people of America and providing nourishment as well as nutrition education to those in need are run and operated under the USDA Food and Nutrition Service. Activities in this program include the Supplemental Nutrition Assistance Program, which provides healthy food to over 40 million low-income and homeless individuals and families each month,. USDA is a member of the United States Interagency Council on Homelessness, where it is committed to working with other agencies to ensure these mainstream benefits are accessed by those experiencing homelessness. The USDA also is concerned with assisting farmers and food producers with the sale of crops and food on both the domestic and world markets. It plays a role in overseas aid programs by providing surplus foods to developing countries. This aid can go through Agricultural Act of 1949, section 416 (b) and Agricultural Trade Development and Assistance Act of 1954, also known as Public Law 480 or Food for Peace, provides the legal basis of such actions. Presently, the USDA is a partner of the World Cocoa Foundation. Allegations have been made that throughout the agency's history that its personnel have discriminated against African-American farmers, denying them loans and access to other programs well into the 1990s. The effect of this discrimination has been the reduction in the number of African-American farmers in the United States. In 1999, the USDA settled a class action lawsuit, the Pigford Case, alleging discrimination against African-American farmers in the late twentieth century. The government's settlement of nearly $1 billion with more than 13,300 farmers was reportedly the largest civil rights claim to date. The 2008 Farm Bill provided for additional farmers to have their claims heard, as 70,000 had filed late in the original program. In 2010 the federal government made another $1.2 billion settlement in what is called Pigford II for outstanding claims. Many black farmers across the nation experienced discrimination in their dealings with U.S. Department of Agriculture agencies in their states. Across the nation, black farmers alleged, and the USDA later agreed, they were denied access to loans and subsidies provided by the government. On a national level, farm subsidies that were afforded to white farmers were not afforded to black farmers. Since they were denied government loans, emergency or disaster assistance, and other aid, many black farmers lost their farms and their homes. Black farmers nationwide joined in a class action discrimination suit against the U.S. Department of Agriculture (USDA). The first prominent cases were filed in federal court in 1997. An attorney called it "the most organized, largest civil rights case in the history of the country." That year, black farmers from at least five states held protests in front of the USDA headquarters in Washington, DC. Protests in front of the USDA were a strategy employed in later years as the black farmers sought to keep national attention focused on the plight of the black farmers. That year, representatives of the National Black Farmers Association met with President Bill Clinton and other administration officials at the White House. And NBFA's president testified before the United States House Committee on Agriculture. ^ "FNS Supplemental Nutrition Assistance Program (SNAP)". Fns.usda.gov. 2013-06-21. Retrieved 2013-12-29. ^ a b Pickert, Kate (July 23, 2010). "When Shirley Sherrod Was First Wronged by the USDA". ^ a b Published: April 15, 1999 (1999-04-15). "Judge Approves Settlement for Black Farmers". New York Times. Retrieved 2013-12-29. ^ Evans, Ben (2008-06-28). "(2008)". USA Today. Retrieved 2013-12-29. ^ "PBS The News Hour (1999)". Pbs.org. Retrieved 2013-12-29. ^ Homecoming: The Story of African-American Farmers - Charlene Gilbert, Quinn Eli - Google Boeken. Books.google.com. Retrieved 2013-12-29. ^ Treatment of minority and limited resource producers by the U.S. Department ... - United States. Congress. House. Committee on Agriculture - Google Boeken. Books.google.com. Retrieved 2013-12-29. ^ Where Rebels Roost... Mississippi Civil Rights Revisited - Mba Susan Klopfer, Fred Klopfer, Esq Barry Klopfer - Google Boeken. Books.google.com. Retrieved 2013-12-29. ^ Morning Edition (1999-03-02). "Black Farmers Lawsuit". NPR. Retrieved 2013-12-29. ^ Published: April 15, 1999 (1999-04-15). Judge Approves Settlement for Black Farmers", The New York Times (1999)""". New York Times. Retrieved 2013-12-29. ^ "National Public Radio (2006)". Npr.org. Retrieved 2013-12-29. ^ "(2006)". The Washington Post. 2006-09-29. Retrieved 2013-12-29. ^ Evans, Ben (2008-06-28). "Associated Press (2008)". Usatoday.com. Retrieved 2013-12-29. ^ Help Ahead for Black Farmers", National Public Radio (2008)""". Npr.org. Retrieved 2013-12-29. ^ Written By BEN EVANS, Associated Press Writer (2012-03-12). "(2008)". FOXNews.com. Retrieved 2013-12-29. ^ Etter, Lauren (2008-10-23). USDA Faulted Over Minority Farmers", The Wall Street Journal (2008)""". S.wsj.net. Retrieved 2013-12-29. ^ Fears, Darryl (2008-10-23). USDA Action On Bias Complaints Is Criticized", The Washington Post (2008)""". Washingtonpost.com. Retrieved 2013-12-29. ^ By the CNN Wire Staff (2010-12-09). Obama signs measure funding black farmers settlement", CNN.com (2010)""". Articles.cnn.com. Retrieved 2013-12-29. ^ Sharon LaFraniere (April 25, 2013). "Federal Spigot Flows as Farmers Claim Discrimination". The New York Times. Retrieved April 26, 2013. ...claimants were not required to present documentary evidence that they had been unfairly treated or had even tried to farm. ^ Martin, Washington Bureau, Andrew (2004-08-08). "USDA discrimination accused of withering black farmers - Chicago Tribune". Articles.chicagotribune.com. Retrieved 2013-12-29. 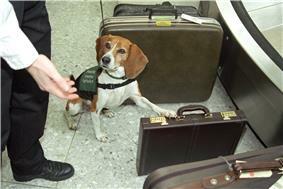 The Beagle Brigade are part of the USDAs Animal and Plant Health Inspection Service. This piece of luggage at Washington Dulles International Airport may contain contraband. The result of such longstanding discrimination is that black farmers have been forced out of business at a rate three times faster than white farmers. In 1920, 1 in 7 U.S. farmers was African-American, and now the number is 1 in 100. USDA spokesman Ed Loyd, when acknowledging that the USDA loan process was unfair to minority farmers, has claimed it is hard to determine the effect on such farmers. As of 2013, 90,000 African-American, Hispanic, female and Native American farmers had filed claims, some fraudulent, or even transparently bogus. Lack of documentation is an issue complicated by a practice by the Department of Agriculture of discarding denied applications after only three years. In Maple Hill, North Carolina the number of successful claimants was 4 times the number of farms with 1 out of 9 African-Americans being paid. After numerous public rallies and an intensive NBFA member lobbying effort, Congress approved and President Barack Obama signed into law in December 2010 legislation that set aside $1.15 billion to resolve the outstanding Black farmers cases. NBFA's John W. Boyd, Jr. attended the bill signing ceremony at the White House. Later in 2008, the GAO issued a new report sharply critical of the USDA's handling of discrimination complaints. The GAO recommended an oversight review board to examine civil rights complaints. In 2008 hundreds of black farmers, denied a chance to have their cases heard in the Pigford settlement, filed a new lawsuit against USDA. The Senate and House versions of the black farmers bill, reopening black farmers discrimination cases, became law in 2008. The new law could affect up to 74,000 black farmers according to some news reports. President Barack Obama, then a U.S. Senator, lent his support to the black farmers' issues in 2007. A bill cosponsored by Obama passed the Senate in 2007. As the organization was making headway by gathering Congressional supporters in 2007 it was revealed that some USDA Farm Services Agency employees were engaged in activities aimed at blocking Congressional legislation that would aid the black farmers. In 2007 Boyd testified before the United States House Committee on the Judiciary about this legislation. In 2006 the Government Accountability Office (GAO) issued a report highly critical of the USDA in its handling of the black farmers cases. Environmental Working Group and NBFA issued a report in July 2004 accusing the USDA of withholding nearly three out of every four dollars in the multi-billion dollar settlement of discrimination cases. The report says that the U.S. Department of Justice and the USDA pursued a path of "willful obstruction of justice" in blocking many of the cases. It was later revealed that one DoJ staff "general attorney" was unlicensed while she was handling black farmers' cases. NBFA called for all those cases to be reheard. The NBFA's president was invited to testify before congress on this matter numerous times following the settlement including before the United States Senate Committee on Agriculture on September 12, 2000 when he testified that many farmers had not yet received payments and others were left out of the settlement. NBFA asked Congress to pass legislation that would ensure a full resolution of the discrimination cases. Farmers in Alabama, Mississippi, Arkansas and Georgia were among those affected by the settlement. Judge Friedman appointed a monitor to oversee the settlement.